Polo vs Jazz: Popular opinion differs from experts! Last week CarToq.com member Aditya Raj Singh asked for help to choose between the VW Polo 1.2 Highline Petrol or Honda Jazz. It is a tough one: choosing between two strong and stylish brands, both offering a strong product proposition. Babychen Mathew: Jazz it is! It’s spacious, it’s got a powerful engine, more boot space than some sedans, it’s got Honda reliability. Kunal Sharma: Honda Jazz. Don’t have to think on this one. Unless you care about build quality, paint job and if you are a fan of German styling. Jazz is better than the Polo in many specs and features. Aravindhan: I suggest Honda Jazz because it has refined engine, good performance, decent mileage and has a really spacious cabin with 366 litre luggage space (practical for a family getaway or even very long trips). But based on responses by other CarToq.com members, Polo seems to be the preferred car. On the site’s FB page, 126 people “voted” their preference. 6 out of 10 members said Polo is a better car. 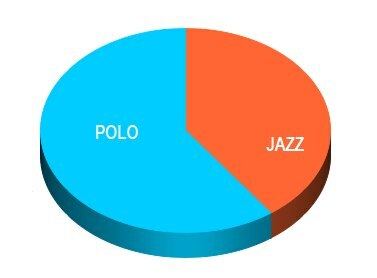 So that’s 60% saying Polo is a better car than Jazz. The question clearly needs to be explored further. Let’s summarize what the comparison story said about the two cars. Performance and handling: The experts liked the faster acceleration and better steering feedback of the Jazz. The Polo engine was rated as better for city rides, and feels more solid while cornering. So that’s interesting: Jazz is liked by experts because they like to see extreme performance while the rest regular driving conditions are what they assess the car on. Space and comfort: Jazz has an edge because it is more spacious, while both cars are evenly matches on comfort. So nothing to look for here. Looks: Everyone agrees the Polo is a better looking car. Price and Features: Jazz offers a little more features than Polo (reclining rear seats, USB ports, steering mounted audio controls) but these are not the big features. On those (airbags, ABS, alloy wheels), both cars offer the same. AND the Polo is a little cheaper than Jazz. So the popular opinion makes sense: Polo’s performance and handling is good enough for the regular drivers, and the Polo is a better looking car ( a very important factor in most purchases). And to clinch the argument, Polo is cheaper than Jazz. In summary: Experts were right from their perspective. They like to really push the car and assess its performance, while normal users have less stringent requirements. Take this out of the equation, and the Polo does seem to be a better option. Just to be sure, let’s do a more specific poll amongst us. What is the MAIN reason why you prefer the Polo? Vote YOUR VIEW above. « Most comfortable premium hatchbacks in India!